Erin is a motivational speaker, empowerment expert and best-selling author. She has extensive experience in various industries with a primary focus on health and wellness. Erin served as a medic in the United States Air Force both state side and overseas. 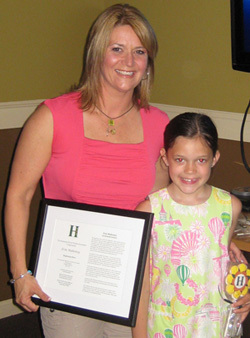 In 2009 Erin created the Girl Power programs. Her 8-week after-school, community programs and extraordinary events use positive thinking, self-awareness activities, life lessons, fitness and energy work to build confidence, courage and strength. Erin founded Girl Power Go, LLC with a mission to empower girls and women everywhere! She studied meditation, relaxation, and stress reduction at the Center of Mindfulness at the University of Massachusetts Medical Center. Erin is a contributing writer for Aspire Magazine and has been featured as one of Boston’s Most Inspirational Stories. She serves on the Women Veterans Network Steering Committee for the Commonwealth of Massachusetts and is currently pursuing advanced Emotional Freedom Technique (EFT) Tapping practitioners accreditation to better serve adults and children that suffer from PTSD, anxiety, depression and transition stress. Erin is passionate about helping others discover their own bright light. Erin is the founder and CEO of Girl Power Go, the empowerment company that is on a mission to empower girls and women everywhere! Erin recently published her third book and most recent best-seller, Positive Vibes for Women. She inspires and motivates people to step outside of their comfort zone, do what feels exciting, dream BIG and live a life that has positive impact on the world! When she’s not speaking, training, writing, signing books or at Gillette Stadium watching her New England Patriots win, Erin is at home in Massachusetts raising her two sons with her husband. She's my hero because she tells girls they can make a difference in their lives whenever they want to. She does it by telling girls that they can be strong no matter what. She makes them scream "I am fabulous!" or "I am excellent!" and expressions like that. It makes us feel excited and joyful. She tells girls that you should believe in what your heart tells you. Ms. Mahoney makes girls feel like they are very special to the world and not just one little piece of it.